There is a lot of space debris floating around our planet.Down on Earth, we hardly notice. To raise awareness, Dutch artist Daan Roosegaarde has created his Space Waste Lab, on display at KAF in Almere from Friday 5 October. When you look up at the sky, the chances are slight you’d spot any space debris. But in December 2017 it became possible on the Maasvlakte in the Dutch city of Rotterdam. There, on a remote sandy beach, Dutch artist Daan Roosegaarde tested his new art project: Space Waste Lab. 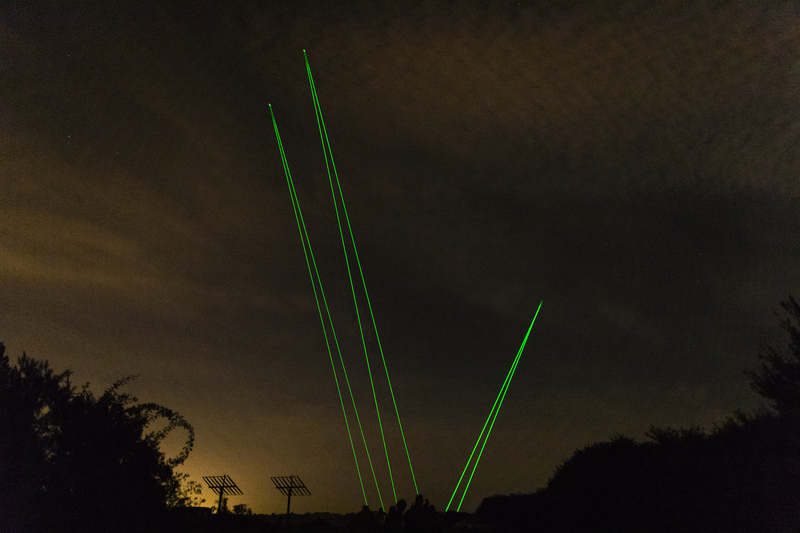 By pointing powerful light columns to the heavens, Roosegaarde creates an arrow of light that points directly at a piece of space debris. ESA’s Clean Space team is a leading expert in the field of space debris. One of the projects the team is working on is e.Deorbit, a mission to catch and dispose of a derelict ESA-owned European satellite. There are around 29 000 items of debris more than ten centimetres in diameter, posing a danger to working satellites and the International Space Station, and potentially us. “Very large and solid objects, like rocket parts, can also hit the ground after re-entering the atmosphere,” Van Pelt adds. On any given moment, ten large pieces of space debris the size of satellites or a rocket stage are floating right above your head, explains Van Pelt. Artist Daan Roosegaarde wants to give these objects a face with his Space Waste Lab. Aside from the live performances – which will be held on 5-6 October, 9-10 November, 7-8 December and 18-19 January – the Kunstlinie Almere Flevoland (KAF) will also host an indoor exhibition. One video projection will use real-time data to show the debris flying over Almere, while another will show Earth’s overall debris halo from space. The indoor exhibition will also display ESA-provided artefacts, including test plates simulating a 7 km/s debris strike and part of an actually flown solar panel from the Hubble Space Telescope, left with debris craters after eight years in orbit. The goal of Space Waste Lab is to create a ‘living laboratory’, where the public not only gets to learn about space debris but also gets to act as a potential source of creativity. Dutch ESA astronaut André Kuipers also advised Daan Roosegaarde, along with NASA sources. “I’m a strong believer in cooperation between technologists and artists,” says Franco Ongaro, ESA Director of Technology, Engineering and Quality. “We believe in what we do as a service to society, but we are often unable to communicate its worth effectively enough. Artists not only communicate vision and feelings to the public, but help us discover aspects of our work which we are often unable to perceive. For more information, please visit KAF.nl and Studio Roosegaarde.